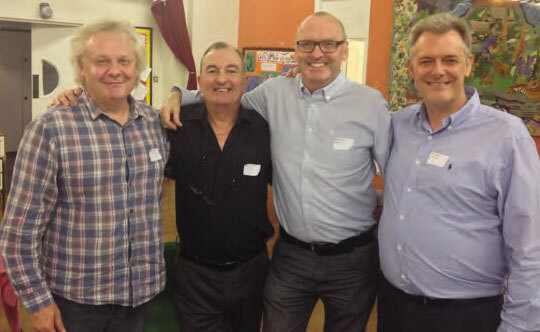 Michael Nicholls, Peter Love, Neil Baugh and Rob Smith. Thanks to some very welcome and greatly appreciated help from Rob Smith and his wife, Kelly, the 2014 choir reunion went ahead as planned. After missing a year in 2013, it was good to get back to normal and with 43 able to attend, including 35 ex-choristers, the figures were about the same as two years ago. Bearing in mind that about 30 had sent their apologies, and they have all attended in the past, the numbers could have been a lot higher, but as often happens, a clash of dates in the diary had its usual effect. For the first time, we were able to welcome the Chairman of The Old Wandsworthians Memorial Trust, Bob Andrews, and his wife, which provided us with an opportunity to offer personal thanks to the Trustees for their continued generous support for our reunions in the form of a grant, which is obviously greatly appreciated. Without their help, our events would have to take a completely different format. As the years move on, it is inevitable that familiar faces start to disappear and this year was no exception. Having lost Martin Lince in 2012, sadly Mary died in March 2014 and this was only the second reunion without the Lince family being represented. However, we were fortunate to have them with us for so long, as Martin reached the age of 97 and Mary did even better, getting to 99. On a much happier note, we were pleased to welcome one of England’s finest solo tenors, Ian Partridge, and his wife Ann, to their first reunion. Many of us were able to recall taking part in the televised performance of Britten’s Saint Nicolas, filmed in St.Albans Cathedral, with Ian taking the leading part so distinguishingly. Health problems prevented a few regulars joining us this year, notably Nigel Spearing and Cynthia Phillimore. Cornwall was just that bit too far to travel for John Tobin, and Glyn Harvey had hoped to attend, but unexpected problems following a replacement knee operation prolonged his recovery. After several years of trying to overcome unforeseen hurdles, the choir now has its own website – www.wandsworthschoolchoir.org. Although it is only in its early stages, it is up and running. A huge amount of memorabilia is available and the main task is to ensure that all the major historical events that the choir took part in are listed. In order for that to be achieved, it is important that anyone with anything to contribute makes contact with me at the earliest opportunity, either by phone (01372 456840) or via e-mail (rayandkathy@talktalk.net). With so many of us having collected things over the years, there is bound to be duplication, but it’s far better for me to see important items two or three times, rather than not at all.